"No, not THAT Rocky... or THAT one... the OTHER Rocky." The boxing biopic is an old standby in my neck of the woods. It's a natural fit, boxing and the movies. Fighters and the people that surround them are generally a colorful bunch, and the drama inside the ring as well as outside it makes for compelling narratives. Some are hits, some are misses, but all of them LOVE to revel in the warts. The nitty and the gritty. 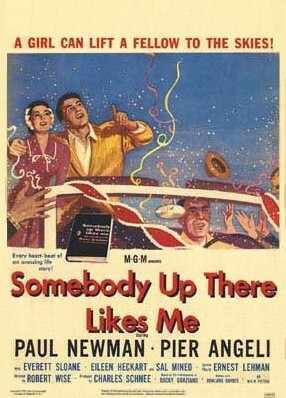 And Somebody Up There Likes Me is no exception. The story of former Middleweight Champ Rocky Graziano starts, like so many others, in the brutal streets of New York. At the start of the picture young Rocky Barbella (a breakout role for a staggeringly young Paul Newman) is fresh out of juvie and he immediately falls back in with his old hoodlum pals (a gang that includes the eternally baby-faced Sal Mineo and a debuting Steve McQueen). They rob, they vandalize, they run from the cops, all to the increasing anxiety of Rocky's mom (played by a very overwrought and teary-eyed Eileen Heckart), Rocky's dad (Harold J. Stone) is less interested in his son's future, resigned to the idea that he'll never amount to anything (that is, when pop's not resigned to downing more hooch than Ernest Hemmingway on, say, a weekday). And from the looks of things, Pa Barbella might be right. The first half of the film deals with young Rocky's EXTREMELY checkered past, which includes a stint in Sing Sing, going AWOL from the Army (which lands him in Leavenworth), and more assaults that Ernest Hemmingway on, say, a weekday (Papa's really taking it on the chin in this review. I apologize for that. He's a helluva writer. He just liked to drink and fight is all...). During his flight from the Army, Rocky has a few pro fights under the name "Graziano" in order to earn some quick cash (the reason he's gone AWOL is for, of all things, punching an officer in the kisser, and he's fighting under the misguided notion that maybe he can payoff the officer he socked... yeesh Rock... way to throw gasoline on the fire....). This perfunctory trip into the world of prizefighting does nothing to light a competitive feeling in Rocky, but it does make one thing perfectly clear: Rock hits like a mule kicks. He might be unpolished, but he's got the thing that cannot be taught, and that's sheer, unadulterated power. Eventually some reasonably kind souls both inside prison and outside the walls convince that Rocky would be better off punching people for a living rather than robbing them and then punching them. Rocky is reluctant to go down that career path, but eventually begins to enjoy the notoriety it gains him in the neighborhood and lifestyle it affords him. I have to say, up until this point of the movie, I was really having a hard time finding something to like about the story of Rocky Graziano. As he's portrayed in this film, he seems to have few redeeming qualities. He's violent, callous, and, at times, just downright stupid. This certainly isn't a rarity in the realm of boxing biopics, but it goes on for nearly too long, making it a tough road back to redemption in the mind of, at least, this audience member. Maybe that's why I liked this movie so much. The work of writers Ernest Lehman and the autobiography written by Graziano (along with Rowland Barber), as well as the efforts of director Robert Wise paint the picture of an almost irredeemably bad man, and they manage to redeem him. How? Well, with the love of a woman of course! Pier Angeli plays Rocky's eventual love interest, Norma, and her tenderness wrapped around a good dose of toughness is enough to soften Graziano's rough edges. It's a tough road to hoe; maintaining the balance between drama and melodrama with so much expiation and emotion getting thrown around. But everyone comes out clean on the other side, their humanity intact and my gag reflex left untested. And in the clich�-riddled world of boxing movies, that's also not always a guarantee. God bless whoever made the decision to keep this filmed in glorious black and white. It's got that brilliantly clear look to it, and it just fits the world of boxing, particularly when telling the story of such a tough character like Graziano (It earned Best Art Direction-Set Decoration, Black-and-White Oscars for Cedric Gibbons, Malcolm Brown, Edwin B. Willis, and F. Keogh Gleason and a Best Cinematography, Black-and-White award for Joseph Ruttenberg). The ring action is fantastic, treading the line between real action and staged punches as deftly as the screenplay avoided the schmaltz. Newman looks like a boxer, particularly one of Graziano's ilk (a puncher, with very little boxer in him). The trauma, both in the ring and post-fight, is real and affecting. During one stretch, an increasingly bruised and beaten (but victorious) Graziano comes home after a number of fights, each time eliciting a shreik from his infant daughter. His final entrance in the montage actually gets a gasp from his wife, with his now pre-school-aged daughter assuring her, "It's okay Mommy.. it's only Daddy!" Its a credit to the actors AND the make-up effects people that this scene comes off as funny but not cutesy. His final beaten iteration is gasp-worthy. And a special note should be given to Everett Sloane, who plays Irving Cohen, Rocky's manager and trainer. In a role that could have been strictly played for laughs, he brings just the right amount of poignancy to it. It's a shame more people playing the trainer role don't review this before launching into full on "I coulda been a contenda!" pathos. As I've said, I liked so much about this movie. The cinematography, the story, the performances. And while it worked very well as a sports drama, it worked even better as a love story. Not just the redemptive powers of love between two people, but as a picture of how hard it is to express love for some people. A good portion of the beginning of the movie is spent with Graziano and his doting, anxious mother and his alcoholic, seemingly uncaring father. Not to get too deep, but the exploration of the relationship and love (or lack thereof) between child and parent is very well done also. If the scene before the big fight finale between Newman as Rocky and Harold J. Stone as his dad doesn't put a lump in your throat, then maybe you should call your Dad.